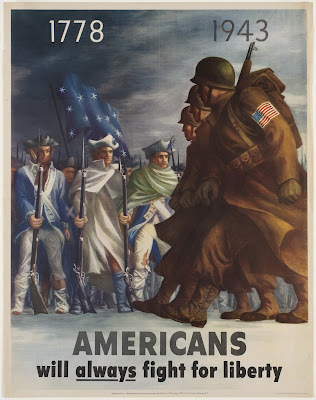 "Restoring the Founders Success Formula"
I would like to encourage each and every one of you to take these 2 hours out of your day to be a part of some of the most incredible patriotism and encouragement that take place at these meetings. We hear so much bad news and this administration and congress seem like they're operating on insanity. There is so much hope and there is so much we can do. "Let's get movin'!!" mode and their inspiration and motivation is contagious. for not upholding her oath to the Constitution of the United States. Paul has gone one step further and he is now running for a position in his district. Facebook, Twitter & Blogs - Oh My! Macon Co. Republican Club Meeting at the Comfort Inn. Dinner served. Free informative meeting open to the public. Topic: What businesses, individuals, and campaigns are doing online through "social networking." Officer elections. Contact person: Jon Dwiggins (660) 651-1931. 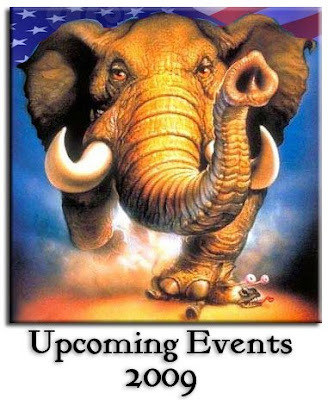 Saturday, October 24, 9- 3 P.M.
for Republican Women in Jefferson City. Tickets are $20 and include lunch. For more information: mogop.org/womenssummit or (573) 636-3146. 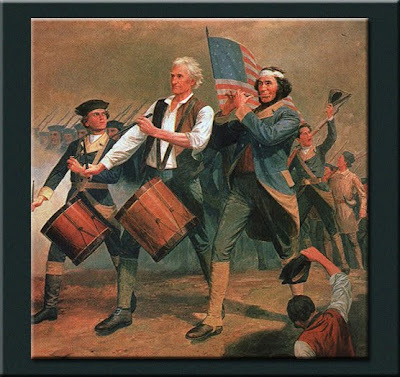 Saturday, October 31, 10-12 P.M.
commentators: John Putnam, Sgt. 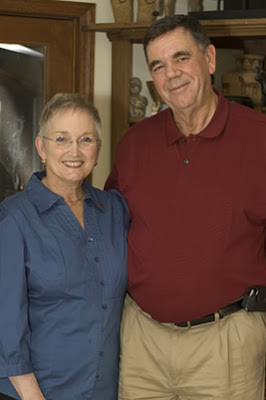 Paul Curtman, and Bev Ehlen. Thursday, November 12, 7 P.M. 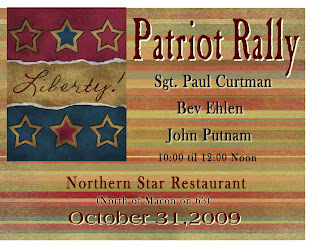 Discussion will include Lincoln Dinner and elections for 2010. Contact: Jim Willis (660) 651-1144. A well laid out plan to infiltrate every single home in the World. Have your eyes wide open and use wisdom for your family. "My ten-year-old daughter loves “So You Think You Can Dance.” I suspect most eight to eighteen-year-old girls do. So, my question to the producers of this hit show is: “Why are you pointing my daughter to a web page asking her to work at Planned Parenthood?”"
"National service and volunteerism is a top priority of both the President and the First Lady. A broad effort has been launched to promote this priority. We’ve seen this in the May 12th White House briefing, the August 10th and 27th art community conference calls, and now in a new effort by the Entertainment Industry Foundation...All of these efforts are driving would-be volunteers to Serve.gov. The question is, for what purpose?" Michelle Obama has even created a video expressing the importance of national service. "For the entire week, these and other networks will use our favorite TV shows to shine a spotlight on the power of service. Fifty prime-time shows have already agreed to participate and this number is growing. Imagine: for seven days straight, whether viewers tune-in to shows like ABCs Extreme Makeover: Home Edition, NBCs 30 Rock, CBSs CSI: Miami or Foxs So You Think You Can Dance they will watch programs infused with inspirational volunteer messages." Check Out All The Participating Shows! Find Out How Your Favorites Are Taking Part. The Republican National Committee unveiled a new website early Tuesday morning that promises to increase grassroots participation and offers improved navigability and smarter marketing and fundraising tools for the GOP, according to party officials. Upon reaching the new GOP.com, RNC Chairman Michael Steele takes a virtual step onto the computer screen and leads users on a tour of the site’s new features. Conscious of the propensity for online social networking to mobilize activists, the new website was designed with an unmistakable attentiveness to social media, having devoted a significant portion of the landing page’s real estate to Facebook, Twitter, YouTube, and Flickr. At first glance, the RNC’s new digital threads look nothing like a typical political website. 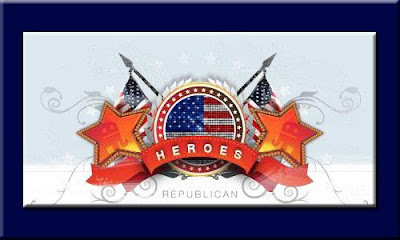 From the dynamic logo featuring user-submitted pictures of supporters to the refreshingly simple navigation menu, the revamped and reorganized GOP web presence represents a commonly-preached but rarely-practiced belief on Capitol Hill: that the best ideas come from outside the Beltway. In addition to seamlessly incorporating prominent social networks like Facebook and Twitter into their new platform, the RNC also revised their now-defunct in-house social network, myGOP. Renamed to represent Steele’s embrace of organic activism and community engagement, their new social network, dubbed “OurGOP,” allows users to organize by location, issue, or candidate slate. And as a supplement to the new “you-centric” social network, RNC officials note an additional innovative feature: users can securely login with third-party credentials, including OpenID and Facebook rather than creating a new account. The new website is the latest aspect of Steele’s comprehensive rebranding campaign for the GOP, who weathered two consecutive election-year losses in 2006 and 2008. The 2010 midterm elections, Steele hopes, will be different. And that difference will be fostered by surging online conservative activism. 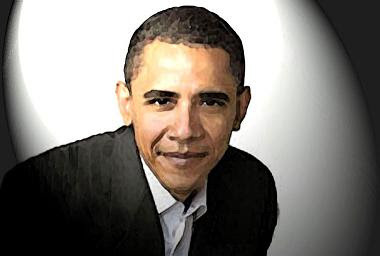 “At GOP.com something new is happening. And that something is you,” said Steele in his video introduction. A new website has been launched for the Bill Stouffer for Congress campaign. Bill Stouffer is a farmer in Saline County and has served as a state senator representing western Missouri since 2005. Bill and his wife, Sue Ellen, live near Napton, a small town near Marshall. A former school board president and graduate of the University of Missouri College of Agriculture, he has been a farmer since 1967. Bill currently serves as Chairman of the Senate's Republican Caucus, Chairman of the Senate’s Committee on Transportation and Vice Chairman of the Senate Committee on Agriculture, Food Production, and Outdoor Resources. He has also led his caucus on veteran’s issues. As a citizen legislator, Bill is considered a leader in transportation issues and is the first Senate Transportation Chairman to have driven the state’s roads in a car, tractor, and a semi. His business experience has also relied heavily on barge and rail traffic. His efforts include finding solutions to fund expansions to Interstates 70 and 44 including truck-only lanes. Health care, gun rights, and agriculture are also top legislative priorities. In 2006, Bill passed an Assisted Living bill senior advocacy groups called “Missouri’s most significant legislation for seniors in a decade” and he continues to focus on reform in brain injury and older adult care. In 2007, Sen. Stouffer passed the Hunting Heritage and Preservation Act, the National Rifle Association’s number one priority in the nation. Bill is also considered a leader in the state in agriculture issues. In the early 1980’s, Bill Stouffer became chairman of the board for MFA, Inc., a farmer-owned cooperative with locations throughout the state. Under his leadership, MFA made significant changes in its management practices including removal of partisan politics and an antiquated distribution system. This transition is attributed to saving MFA, Inc. from bankruptcy. Stouffer has also chaired the University of Missouri’s Ag Foundation, was an elected member of the state’s first corn merchandising council, and was inducted into the Missouri Institute of Cooperatives Hall of Fame in 2008. Born April 19, 1947, Bill is the father of two sons and has four grandchildren. He is an active member of the Missouri Cattlemen’s Association, Missouri Corn Growers, Missouri Soybean Association, Missouri Farm Bureau, Missouri Civil Air Patrol, NRA, and the Smith Chapel United Methodist Church. In addition, Sen. Stouffer has chaired the General Assembly’s 4-H Caucus. From me personally, Thank You Senator Stouffer for running to the frontlines representing Missouri's voice! Co-state Director for MO Fair Tax Law. We'll be updating information as we get it. Please put this date on your calendar and plan on joining us. Note: I apologize for leaving the date off the first announcement! The doctors are speaking out. Is anyone listening? 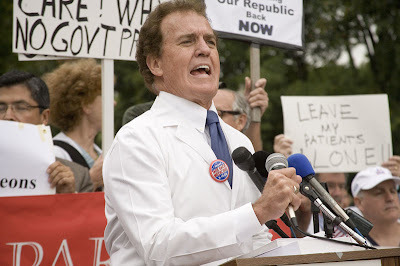 I've asked several of my friends around the country and family members if they know how their doctor feels about government run health care and virtually every single one of them has said that their doctors are opposed to it and most are actively fighting it. I'm sorry to say my own doctor is one of the few who thinks government controlling America's health care would be great. I hear random shot statistics for doctors for and against it and I'm beginning to think some are just pulling a figure out of the air banking that nobody will ask where they got it from. Liberal sources say 77% of doctors are for government run health care. Conservative sources say only 45%. I wish I could hear the doctors who are for it explain why, without it being all Huffington Post talking points. I'd listen, I'd like to understand. There is no doubt that we need health care reform in this country. I don't know anybody who doesn't feel that way and understand the importance. 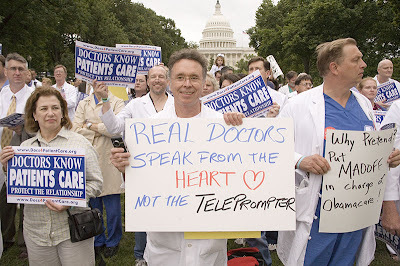 I know there are excellent proposals out there coming from doctors -- but is anybody listening? There is no rational reason for the entire health care system to be thrown out and taken over by government. The liberals rant that the Republicans have their hands deep in the insurance company pockets. But the Democrats have theirs equally as deep in the pharmaceutical & trial lawyer pockets. How the Democrats can look American in the eye and say this has been a bipartisan effort on their part just floors me. To my knowledge not one Republican amendment has made it through. Not one. I know Senator Olympia Snowe (R) ME is their poster child for their gracious bipartisan spirit, but she's one of our finest RINO's who has one foot almost crossed over into Democrat devotion. Arlan Spector comes to mind. Anyway, we know the politicians aren't going to put down their games and my concern is who is going to listen to our doctors? 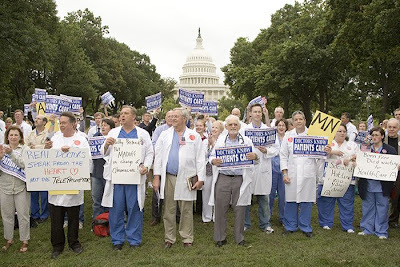 During the 9/12 March on Washington there were hundreds of doctors who took part. There wasn't any news coverage, of course, but I'd like to point them out here. Practicing US physicians uniting to represent the interests and concerns of both patients and doctors in the healthcare reform debate. D4PC endorses the concept of needed healthcare reform, but we recognize it can only be accomplished by proceeding in a cautious and responsible manner. Our recommendations will enable us to reach this goal without requiring the nationalization of the entire American healthcare system. There is no logical reason to hastily pass this legislation by a predetermined deadline. We have one chance to get this right. Bring "all" stakeholders together to help assure a meaningful and sustainable reform by considering many recommendations and proposals. Adopt a patient-centered approach to healthcare reform that empowers patients and promotes freedom of choice. Use the power of government to assist the uninsured obtain health coverage through modification of the tax code, such as tax credits and vouchers. Reduce high insurance premiums by opening up patient risk pools across the entire nation, thereby diffusing risk. Allow the individual/family to be the "owner" of the policy making their health care coverage portable and available if they lose their job or move to a new place of employment. This will eliminate exclusion from the new employer's plan for a “pre-existing” health issue and also eliminate a waiting period to qualify for enrollment. Encourage and expand Health Savings Accounts. Tax-Free savings vehicle for planned and/or unexpected medical expenses. 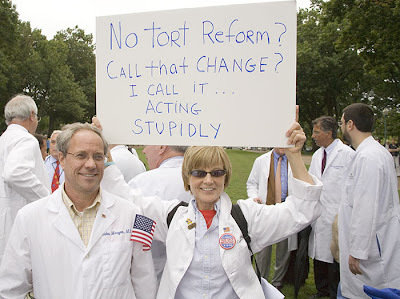 Tort Reform. The costs to our healthcare system secondary to the practice of defensive medicine are over $100 billion annually, or $2,000 per family. Insurance Reform. Guarantee insurability due to pre-existing illness. 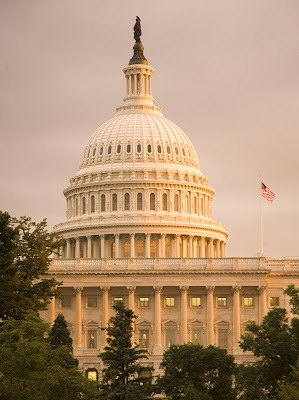 Eliminate Insurance company antitrust exemption. 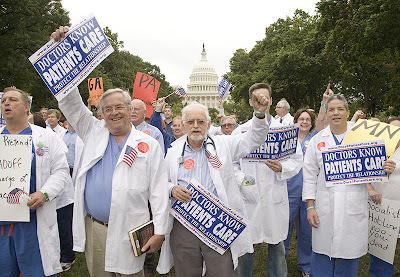 They had their own Doctors Against Obamacare Rally in Washington. September 10, 2009, Washington, D.C.
Today doctors, nurses and other medical professionals came to Washington, D.C. from across the country to show their opposition to Obamacare. 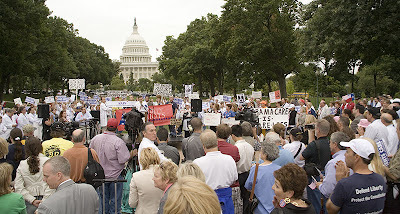 This rally exploded the government-created myth that there is unanimity amongst health care professionals for Democrat plans to take over health care. 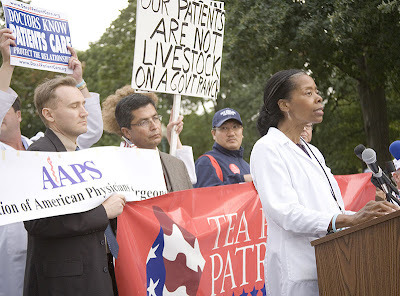 The Association of American Physicians and Surgeons came to D.C. to present a petition from doctors to lawmakers. 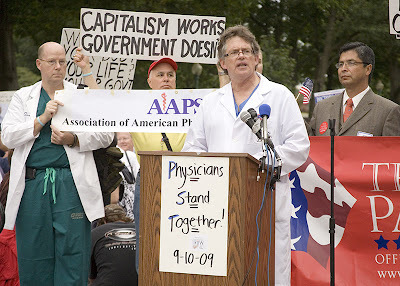 The AAPS has been a voice for private physicians since 1943. Their motto is Omani pro aegroto, “all for the patient”. The doctors met with the representatives from their respective states and argued for a platform that avoids unnecessary bureaucratic intervention in health care. 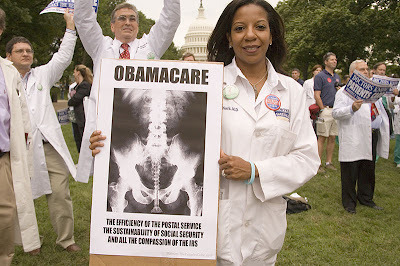 Dr. Shannon Norris, a radiologist from Atlanta, holds a People's Cube poster describing Obamacare as offering “the efficiency of the Postal Service, the sustainability of Social Security and all the compassion of the IRS”. 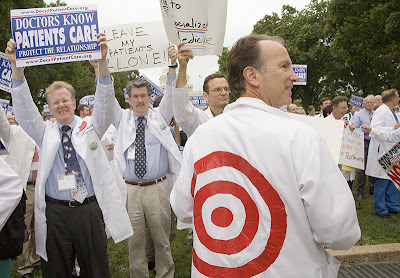 Dr. Steven Ellison, a cardiologist from Georgia, displays graphically how doctors feel about being targeted by a party and president that slander and demonize them. On the podium, speaker after speaker talked about the slurs President Obama has made about doctors performing unnecessary amputations and tonsillectomies out of greed. Not only is it untrue that doctors profit from these procedures, but the premise that they would do such harm to their patients is an insult to doctors. 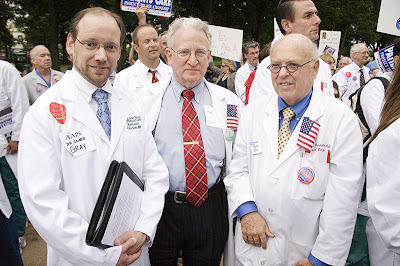 Dr. Hal Scherz, a pediatric urologist from Atlanta, founded Docs for Patient Care to voice doctors’ opposition to the “big rush” for a big government solution to health care reform. 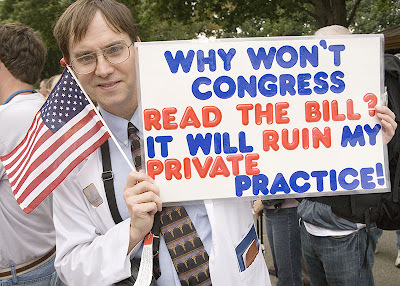 The organization of doctors suggests practical proposals such as tort reform, insurance reform, and opening up insurance pools between states. 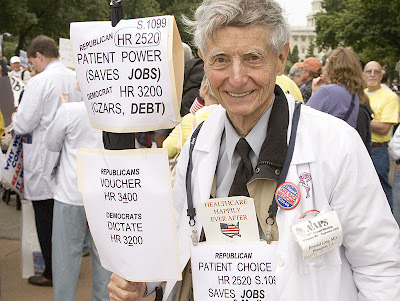 Current reform options purport to be “cure-alls” for every American. But we know that every patient is different, and just like patients, there is no single big-government solution to change health care in this country. Petition point: 1. INDEPENDENCE: Doctors are professionals. They answer to their patients, not the government or an insurance company or any other third party. Treatments should be decided by doctor and patient exclusively. “We are not the enemy,” said Dr. Joyce Lovitt, a pediatrician from Georgia. Petition point: 2. VALUE OUR SERVICES: Physicians have a right to be paid a market-based fee for their services, and to be paid at the time of service or within a reasonable period. 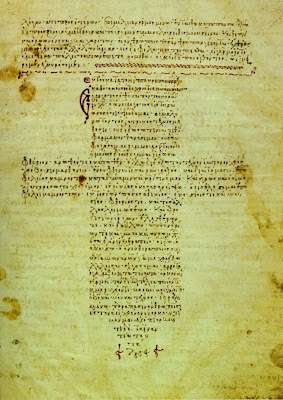 Petition point 3. DOCTORS ARE NOT INSURANCE BILLING CLERKS: Physicians should not be forced to act as billing or collection agents for third-parties, whether private insurance or the government. Petition point 4. REGULATIONS GET BETWEEN PHYSICIANS & PATIENTS: Excessive regulatory burden on physicians is interfering with patient care. We must decrease regulations, not pass more. Petition point 5. LIABILITY COSTS MUST BE REDUCED: Costly defensive treatment and tests, and predatory litigation result in excessive liability costs for physicians and patients alike. 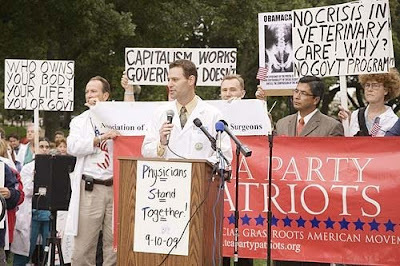 Dr. Scott Barbour, an orthopedic surgeon from Atlanta addresses the rally. Petition point 6. 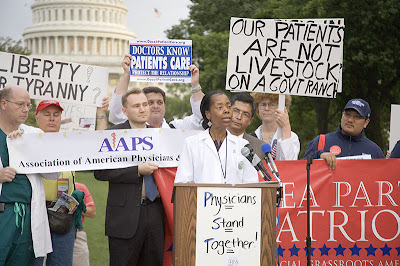 AUTONOMY: Neither physicians nor patients should be forced to participate in government nor private health care plans or programs. Petition point 7. RIGHT TO CONTRACT: Neither physicians nor patients should be prohibited from entering into mutually agreeable private contracts for services and payments. Petition point 8. PRIVACY: Physicians must not be forced to disclose patient records without the express consent of patients. 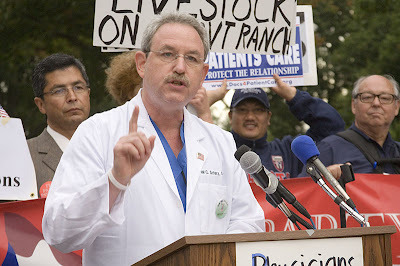 Dr. Phil Gingery, U.S. Congressman from Georgia addresses the Rally. Please don't stop writing, calling, faxing, tweeting Congress. The battle is still going on..